It’s a drive day. Forecasts called for a good twenty-four hours or so before the next storm, so the plan was to position ourselves further east along the South Coast, setting a base to explore the region as conditions change. I was up early to pack. I have a pretty simple system in two bags. One large duffle for personal gear —an ancient watertight Patagonia bag that’s been from Lake Baikal to Fiji to Central Africa—and my camera pack. I have a smaller pack that fits in the duffle for foul-weather outerwear and waders; I usually just stow it in the van so it’s at arms-reach when necessary. My camera bag is bit on the large side, but I’ve yet to wean myself from carrying two too many lenses, and here in Iceland I’m carrying an extra camera body, just in case. The pack is almost heavy, but it’s not too bad. I also have some filters and a bag of extra batteries for the cold… Hold it… No, you’ve got to be kidding me… Where is the battery bag? The top pouch on my pack, where it typically rides, is wide-open—no bag, no batteries. That also means no back-up SD cards. The bag and batteries are on the beach next to the plane at Soldheimasander. I can see it happening. I swapped batteries in the dark, proud of my no-headlamp maneuver, and dropped everything back in the appropriate pouch. Without the final zip—as always, so embarrassing. When, later, I grabbed the pack and flopped the top pouch in place, out dropped the battery bag. A black battery bag, in black of night, on a black beach. I sit back on the hotel bed and consider my options. Go now, wake-up Thor to drive out in the dark before or during breakfast? He’d do it; he’s a nice guy. Maybe I will see if the group wants to go back to the plane for sunrise photos? Neither dramatic nor surreal, no way it lives up to anything like last night, just a broken plane on a barren beach some distance from actual light-catching surf. They’d do it, they’re nice people. Either option, however, puts undo burden on all of us, and we’ve a long drive planned for the day. I’ll just forget about it. I’ve still got two batteries and two SD cards plus a back-up drive. It’s my offering to the aurora, trolls, elves, and some lucky tourist who can use four Canon batteries and a few hundred gigs of storage. Spit. At breakfast, I quietly mentioned my idiocy to Thor and a few teammates, mostly because it had now grown funny to me. But we also had a few other nights of aurora photography coming up (hopefully), therefore, lesson learned: everyone double-check your gear as we leave location. I could see Thor pondering the same recovery options I’d already dismissed, so I insisted we stick to the current plan and we loaded into the van. Actually, what was Thor pondering? He’s a Canon shooter. He’s got friends around here. He could always use more batteries. Too easy. 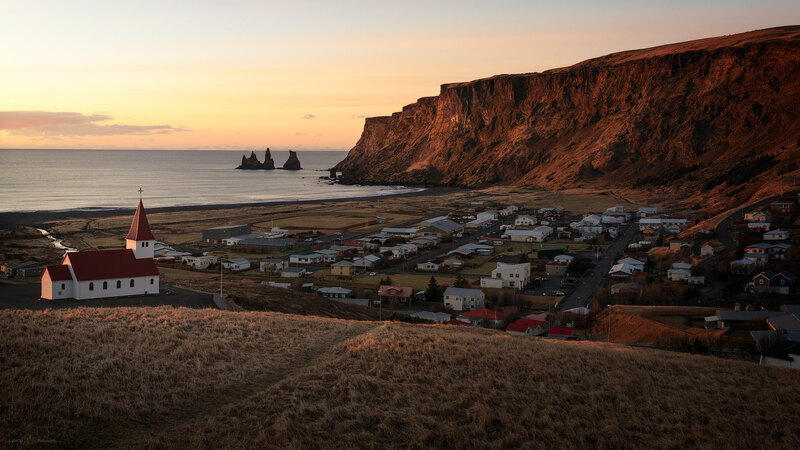 Sunrise panorama at Vik í Mýdar and the sea-stacks of Renisdrangar. 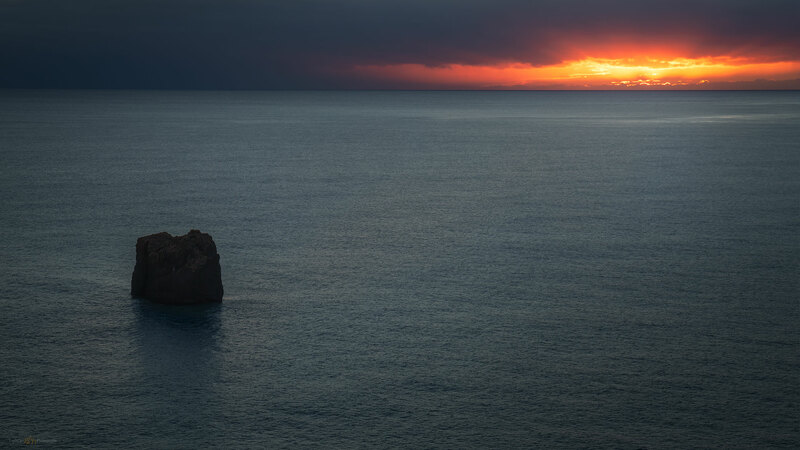 After the stormy drama of our first sunrise shoot, catching the calm sunrise at Vik í Mýdar was somewhat anticlimactic. The skies were crystal clear and the scene was beautiful, but I could not decide what to shoot. Overlook shots need some clouds to get some depth and interest. The volcanic outcrop above the village is striking and leads to the abrupt coastline and rocks stacks at Reynisdrangar. There’s a pretty church in the foreground, but after black church, this one isn’t compelling to me. I’m drawn to the rugged mountains rising to the east with long colluvial aprons, landslide scars, and summit crags. But now I miss the intensity of the scudding clouds and dramatic wind. Silly me. In the cold, we watched a vanload of tourists (like us) set up their tripods on the grass (like us), frame identical compositions (like us), and capture images (like us). But they were still in their van (so not like us). Seems each one, before returning to their seats, set an interval timer, leaving their lonely cameras to continuously snap photos of the slightly changing light. It went on, I’d guess, after we’d packed up and hit the road. They may still be there. Colluvial apron below the crags of Vik. Remnant flows and tuffs at Vik. For the second day in a row, we drove the ring-road through the extended golden hour. Glaciers crumbled from mountain ridges. Waterfalls debouched from every cliff. It almost didn’t matter, we were now aurora addicts, the Kp index wa good, and we wanted the Vestrahorn tonight. The light faded as we arrived at the iconic Glacial Lagoon. This wasn’t our planned destination, but we made time for a recon, as we’d planned a full day in this area tomorrow. I’d seen many scenes—English is hard—from the lagoon but the scale was hard to take in. 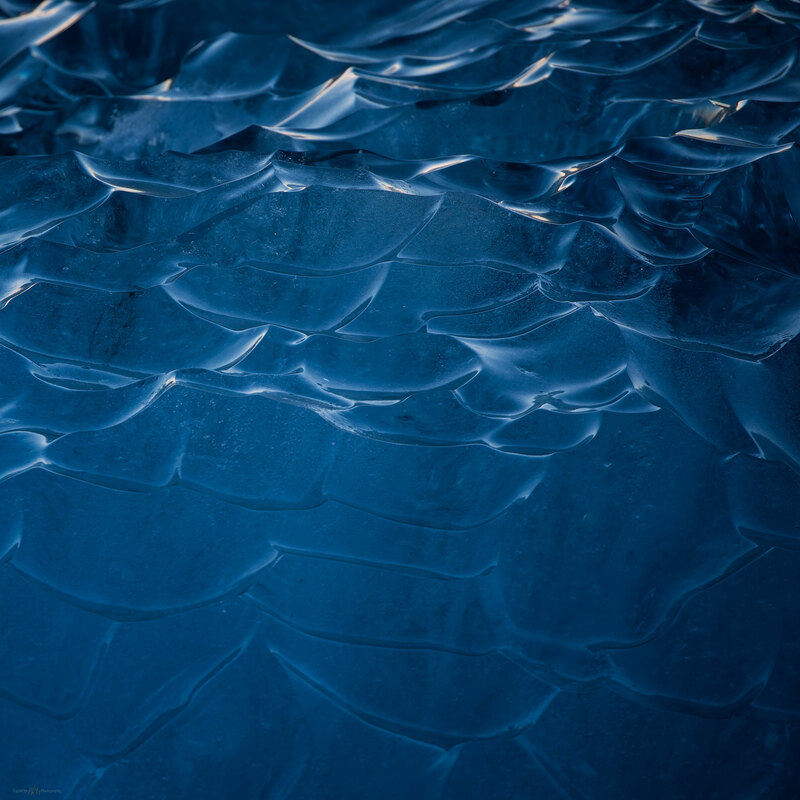 The glacier was far away and the jumble of icebergs and crystalline ice-shards in the tidal outlet of Jökulsárlón was chaotic. I’m glad we had this opportunity to scout the location even in the fading blue light of evening. 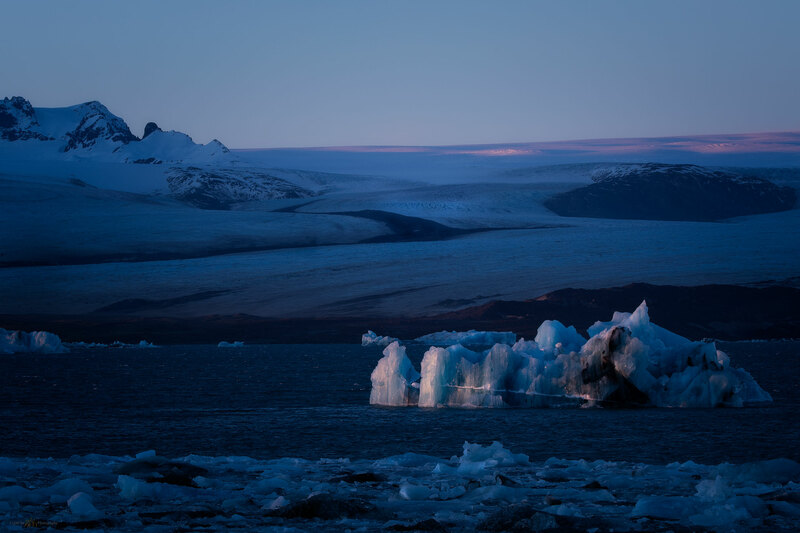 Blue ice of Jökulsárlón against the backdrop of Breiðamerkujökull. We checked in at Hali Country guesthouse, near Glacial Lagoon, and fueled up for another night out. Beer, fish and lamb, coffee. We had developed a definitive pattern. The caffeine soon faded, however, and the next couple hours, once again in the van, passed quietly. Thor eventually left Highway 1 and steered us onto a dirt road where a small group of buildings, the Viking Café, soon appeared in the headlights. Providing the necessary fee, we passed through a simple gate, Nick following close behind. We were at the frozen tidal pool of Stokksnes, the prominence of Vestrahorn rising to the north. 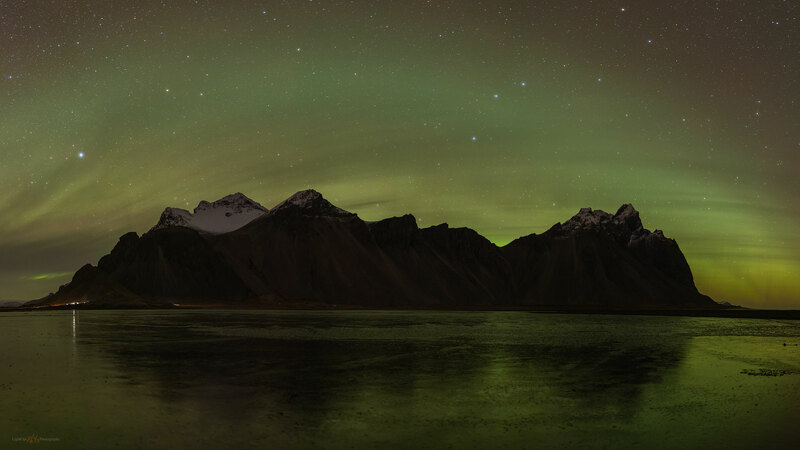 Hints of change in the clouds of Vestrahorn, a panorama at the fading aurora. We gathered on an expanse of ice just as the glow greeted us yet again—this was three nights in a row. Not a record by any standard, but we were fretting and responding to storm warnings as our journey began a few short days ago. We could only dream of this good fortune on our first wind-driven night. The ice at our feet mirrored the distant sky, spreading the luminescence of the aurora rising above Vestrahorn. We critiqued the performance, better and worse, like the light-show connoisseurs we now were. The curtains and spires of light were subtler than the displays of previous nights, but, for me, the natural setting provided so much more. I stood heartily awed and peaceful, once again laughing aloud at the spectacle. This wasn’t a church, or a plane, it was the stage where aurora has danced forever, in the mountains where longitudes collide. We could not make Kirkjafell. The skies cleared but the Snaefellsnes Peninsula, probing proudly westward into the North Sea, could not escape the wind. Snow drifts remained and the gales kept high-profile vehicles from the mountain passes. We were on the peninsula’s southern edge and had hoped to cross over to Grundarfjörður on its north coast for some locations near the iconic wizard-hat peak of Kirkjafell. The group gathered after breakfast, still in the dark of the late morning, and agreed to the decision to drive for the South Coast region, back beyond Reykjavik. I could, however, sense some disappointment in missing the photographic icon. The workshop had only the most basic itinerary, a prerequisite when adapting to conditions of brief wintertime daylight and of chasing cloudless night skies when aurora is likely. So, given the storm pattern, even as it cleared, we had to move on. We wanted the iconic shots, of course. There may be a hundred-thousand photos of Kirkjafell (or any other iconic location), but almost every photographer wants their own. Our photography friends know the shots, and on-line image searches inundate our small screens, but put an original iconic keeper—if you are lucky enough to capture one—on your wall and no one knows there are thousands of the same scene (many probably better, too); for a moment the icon is yours. For now, we drive through almost perfect golden-hour light—the golden hour that lasts all day here. At first it was a bit frustrating, as back-lit storm clouds danced in the volcanic mountains. But we were committed to the goal of the South Coast, the good weather and aurora forecasts pulling us onward. 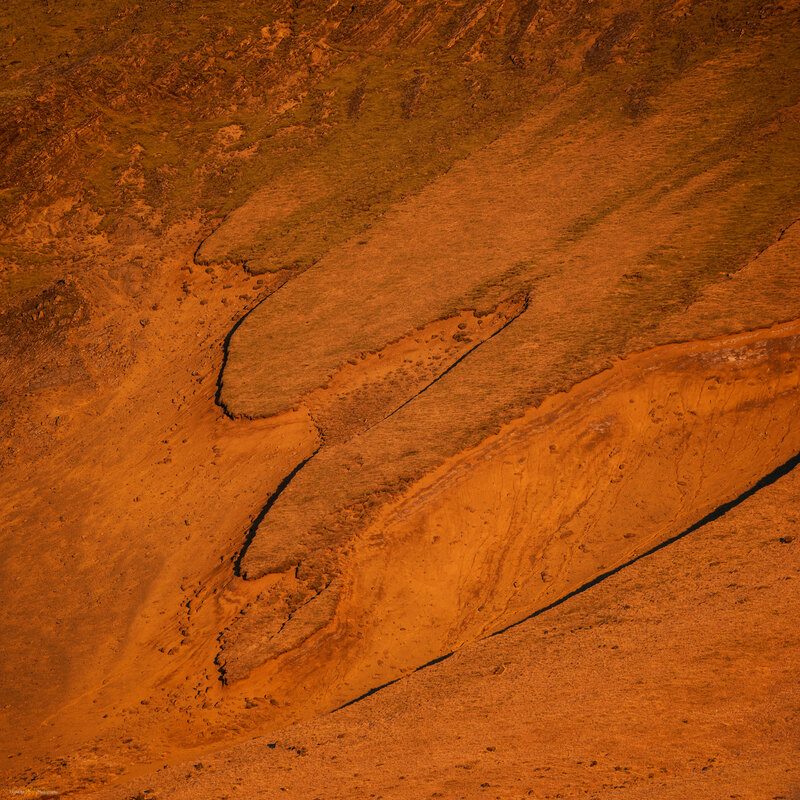 The islands of Vestmannaeyjar — I climbed the volcano Eldfell in 2005. Volcanoes, glaciers, waterfalls, ponies—the beauty of the coastal ring-road unfolded before us. In the slowly setting sun, we crossed the vast braided river Markarfljót where the islands of Vestmannaeyjar loomed far offshore. This kindled the memories of a previous winter visit to the islands in 2005. 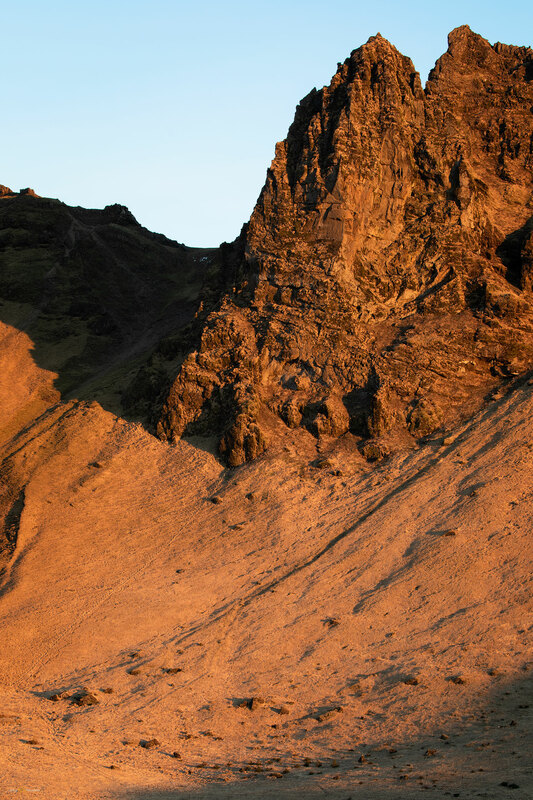 An hour later, the sun and golden light barely changing, Thor finally turned us onto a set of gravelly switchbacks leading to the Dyrhólaey lighthouse. Relieved to have the drive behind us, the group eagerly dispersed along the volcanic rimrock with precarious drops to the sea, arches and seastacks among the waves below. It was a pleasure to walk along the paths and watch the sunset, but I think the long day’s drive had taken its toll. I composed a few images, but I wasn’t really feeling it. The day’s—that is, night’s—highlight came later. A short day’s long sunset at Dyrhólaey. We checked in at the Dyrhólaey guesthouse, met for dinner and brews, and prepped for a late night of aurora photography. We were headed to the Solheimasandur plane wreck on the black sand of glacial outwash, where the Hólsá River meets the sea. 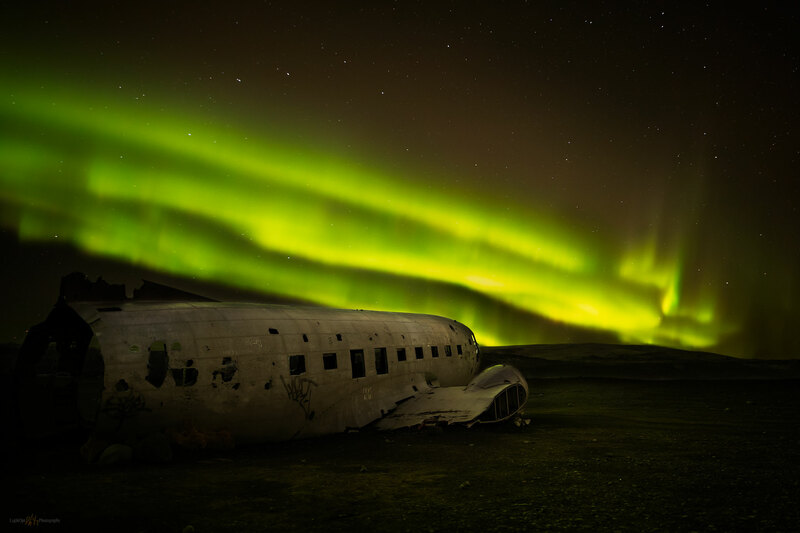 After an emergency landing in 1973, the U.S. Navy Douglas Dakota (Super DC-3) was stripped and abandoned. It’s a few kilometers from the roadside parking, sitting in a barren landscape at the end of a sandy path. It takes a while to walk to the plane and tourists often get lost in the dark or in bleak storms when guiding landmarks are absent. That is, unless you have a key to the gate—a key that Thor picked up from the landowner during a quick stop on our earlier drive. We turned into the two-track road, headlights absorbed by the dark sand and darker skies. It was a perfectly calm, clear evening, but I could see how navigating the black beach at night would be adventurous. Recent snow glistened in low spots and remnant drifts. An icy mist coated the banks of the Hólsá River. We forded the river, breaking through ice and crawling to the other side. Suddenly, out of the blackness, a stark fuselage seemingly jumped into our path. Thor swerved the headlights—I enjoyed his dramatic little maneuver—turning around to unobtrusively park the van. We were alone with the plane. In the moments before your eyes adjust, you walk in pitch black knowing a creepy hulk of an aircraft sits within arm’s reach. Although everyone limited their headlamp use to keep our night-vision, the occasional, random beam would highlight the scavenged, slumbering beast. This was going to be fun. Prelight Checklist. Learning the possibilities with aurora building; winter milky way and evaporating clouds. We gathered to talk about compositions and settings, Nick’s voice in the dark among the shadows of students. The plane at night only really worked as a foreground element, we weren’t here to simply document the dark historical wreck. I practiced setting the ISO super high and taking test exposures. Modern cameras soak up the dimmest light and though ultra-high-ISO images are noisy and granular, you get an idea of how the foreground elements work as a composition. Once that’s done, a low-ISO long exposure, say three or four minutes, lets the ambient light, maybe even some aurora, reveal the foreground with good clarity, but the sky isn’t very good, usually. Keeping your position and increasing ISO a bit allows one to capture a starry backdrop or aurora with a relatively quick exposure. A short duration limits star trails (unless that’s what you want) and keeps the dancing aurora from being a glutenous green blob (unless that’s what you want [um, no]). It takes some experimenting and practice, along with knowing your camera controls blindfolded. 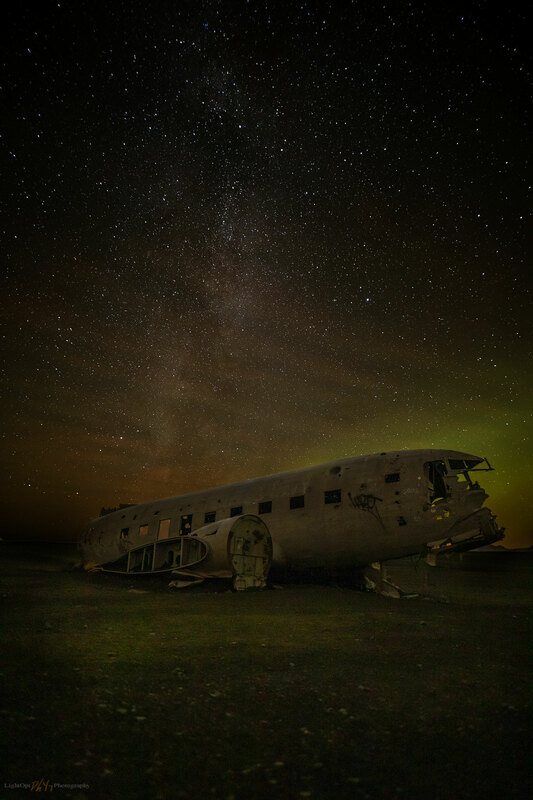 With a bit of exposure blending in photoshop, your memory and emotion of experiencing the night are revealed. A relatively typical astro-landscape photography workflow; typical but not easy. I struggle with the imaging and processing but, again, it’s just so much fun. And, damn, do I know the buttons on my camera now. Approaching Symphony. A concert never forgotten at Solheimasandur wreckage. So much for the technical stuff, how was the aurora? Set against the backdrop of stars and glow of some low clouds, our eyes now adjusted, it was pretty easy to draft compositions. We waited for the light, and I had little expectation that the seminal experience at the black church could be surpassed. I was so very wrong. 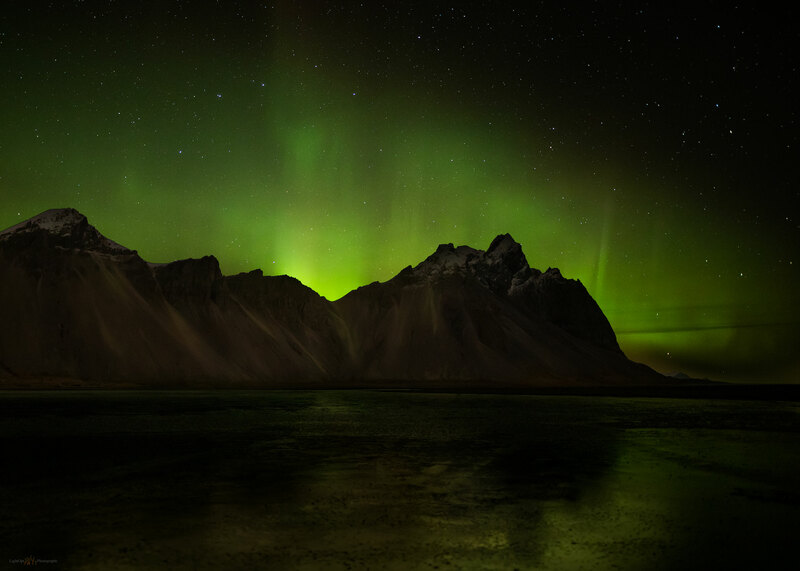 Take away the blistering wind and cold of Snaefellsnes and add a coronal (“full overhead”), multi-colored display and you get an experience few of us will ever forget. It was—cliché alert—magical. Awesome by its original undiluted definition. Music in the sky, in-concert for an hour at least. I could not begin to capture it. From the laughter and ecstatic hoots around me, I knew that the others felt the same. Images are beautiful, and we got some keepers, but after a while I simply laid back and let the symphony sink in. I can still hear it. Host of TrailOption, chasing light and landforms, bound to wander and wonder. 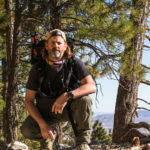 Solidly mid-pack trail runner, photographer, geographer, musician, and writer — there is a little of all that here. With my wife Desna, a founding partner of StoneHeart Ranch, our home on an old alluvial fan above Gardnerville, Nevada. Geoarchaeologist and Principal at Far Western Anthropological Research Group. Thanks for joining me on the trails of the Great Basin and far beyond. These form my personal geography of art and science. --Your information will not be shared or sold. Optional Frontiers — Travel globally, write locally.